Stem cells are a promising alternative for cell therapy applications because of their self-renewing capability and potential to differentiate into a wide range of specialized cell lineages, including osteoblasts, chondrocytes, cardiomyocytes, and neuronal cells. Different kinds of stem cells are considered for cell-based tissue engineering approaches, of which bone-marrow-derived mesenchymal stem cells (BM-MSCs), adipose-derived stem cells (ADSCs) and embryonic stem cells (ESCs) are frequently utilized for advancement of new tissue engineering strategies. Nanostructures created by natural, synthetic, or composite polymeric biomaterials provide artificial templates of the extracellular matrix (ECM). They possess a high surface area to volume ratio, are porous with good mechanical properties, are sufficient to serve as a biomimetic platform to attract stem cells, cause differentiation, and provide functioning of the tissues. Nanoscale features such as fibers, pits, and grooves modulate cell behavior and might even stimulate the differentiation of stem cells to specific lineages; for example, the nanotopographical cues combined with chemical cues influence the neuronal induction of MSCs, resulting in high microtubule-associated protein expressions. Scaffolds can also be impregnated with several ligands for adhesion of receptors to the cells, or with other regulatory molecules and growth factors for designed cell behavior or controlled cell differentiations. 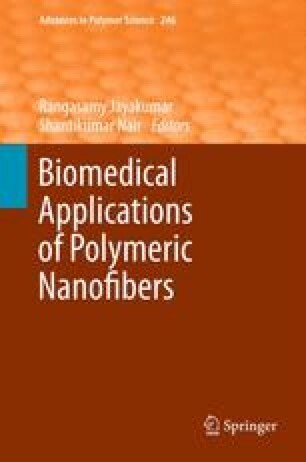 Different polymeric blends or fibers incorporated with nanoparticles (such as hydroxyapatite) in aligned or custom-made patterns can induce specific differentiation of stem cells for bone, cartilage, cardiac, nerve, and skin tissue regeneration. In this review, we will discuss the current state of the art and future perspectives on stem cells and their differentiation on nanoengineered substrates for advanced tissue regeneration. This study was supported by NRF-Technion grant (R-398-001-065-592), and Nanoscience and Nanotechnology Initiative, Faculty of Engineering, National University of Singapore, Singapore.